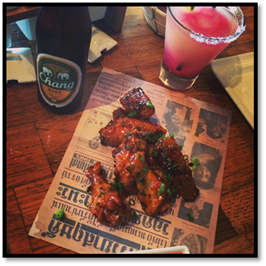 Pakpao is spicing up Dallas’ football-watching “wing scene” with new Thai Chili Garlic Wings from Chef Jet Tila. On Thursday nights and Sundays (all day), you can enjoy 10 wings for $10 and $4 Thai beers (Chang and Singha) while rooting on your favorite team via Pakpao's new 60-inch television. If you can’t make it out to the Dallas Design District, create these scorchers at home with the 5-step recipe below. Make sauce by combining chile sauce and sriracha. Rinse chicken wings in cold water and place wet into a shallow baking dish. Sprinkle the wings evenly with the tempura flour until a thin batter forms. In a large deep-fryer or large Dutch oven, heat oil to 350 degrees F. Dredge chicken wings through one more layer of cornstarch. Place wings a few at a time into the hot oil and cook for 8 to 10 minutes, turning occasionally, until cooked through and golden brown. Season hot wings with salt and pepper and toss into the spicy sauce. Serve hot. Serves 3.